This Air Safari tour is packed with highlights from visiting famous landmarks, experiencing local culture in South Africa, Swaziland, Zimbabwe and Botswana to flying through the African continent. The tour starts out in Johannesburg, South Africa where you will be picked up from O.R. Tambo International Airport. The first few nights you will stay in the Johannesburg area to complete the pilot license validation process and pick up the aircraft before our first flight will begin from Lanseria Airport (FALA) near Johannesburg directly to Swaziland. Swaziland is the real Africa: a small country ruled by an absolute king, stunning nature and friendly African people. We will be letting you experience local African culture in Nsoko, a small town in the back corner of Swaziland. The flight to Nsoko to Kruger National Park is not a long one from there, even though we will have to clear customs twice that day. The best way to experience a Kruger safari is in open safari vehicles: you can use all your senses to experience the bush and get close to the animals. 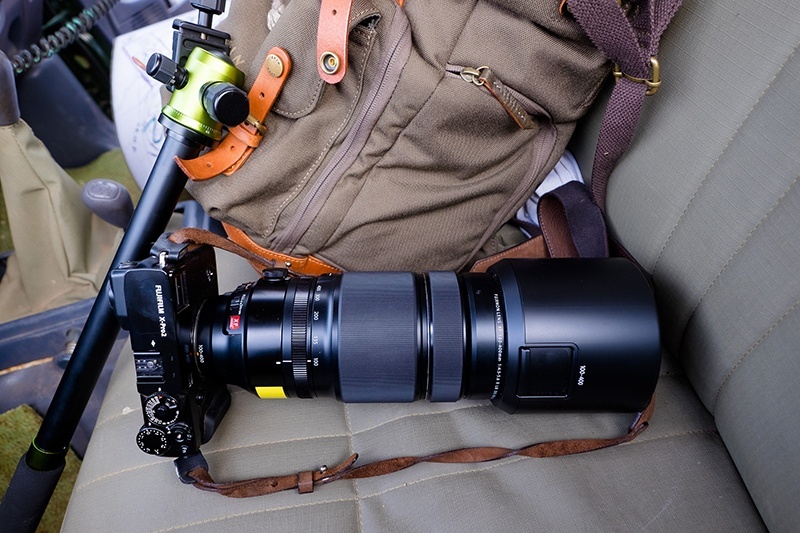 It is also a perfect way to take some fantastic pictures of the flora and fauna surrounding us. Before flying into Zimbabwe, we will fly through the third largest canyon on Earth, the Blyde River Canyon. Our flight to Lake Kariba takes us through Zimbabwe. Lake Kariba is where we will be boarding a boat. The Kariba Lake area feels like you are in a movie such as “Out of Africa.” From Kariba, we will fly over Victoria Falls? After visiting the falls, our trip continues with a flight through Botswana to Maun. Maun is situated on the edge of the world-famous Okavango Delta which we will be exploring for 3 full days in 4x4Drive vehicles. Limpopo-Lipadi is a private game reserve situated along the Limpopo river at the border between Botswana and South Africa. The last days of safari game drives will be carried out here. The trip ends where it started, in the Johannesburg area after our arrival at Lanseria Airport. A 3-week self-fly safari trip flying from Johannesburg to Swaziland. this will include the Kruger area for a multi-day safari and then on through Zimbabwe to Lake Kariba to board a houseboat cruise to view wildlife and the country from the lake. Then you will be able to see the spectacular Victoria Falls and then to Maun, Botswana for a multi-day 4x4Drive safari in the Okavango Delta. The trip will end at the Limpopo-Lipadi Private Game Reserve on the border between Botswana and South Africa, from where you will return back to Johannesburg to end our trip there three weeks later. If you have an EASA or FAA pilot license, we will assist you in getting your pilot license converted to a South African validated PPL license. The validation process is straightforward and includes mostly paperwork, one theory exam on South African Airlaw and a check ride with a local flight instructor once you arrive in South Africa. In addition, we will help you find a suitable aircraft to rent for this trip. 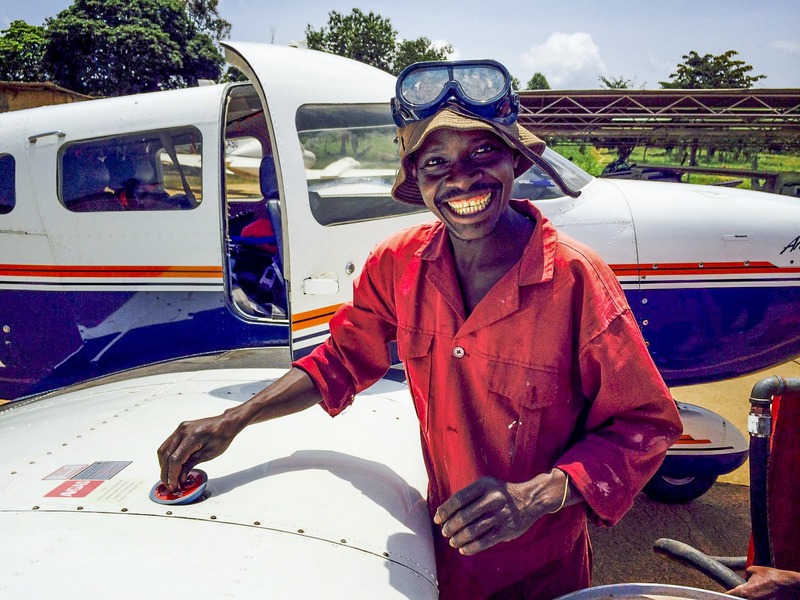 We can also arrange a safety pilot to come with you, but if you know how to fly your aircraft at home, there will be no problem in doing the same in Africa. We will be flying along as well to give a full briefing each morning and to assist where needed. We are here to make the whole process as hassle-free as possible! If you do not have a pilot license, you can fly along as a passenger. You might be able to fly along with one of the participants or we can offer you to fly with one of our partners, a South African aircraft operator that can facilitate a maximum of up to 5 passengers to come along in his 6-seater aircraft on this trip. TRIP START/END LOCATION Johannesburg/Pretoria, South Africa. DEPARTURE DATE/TIME Please arrive latest on October 11, 2019, at 18.00 hours. RETURN DATE/TIME The tour ends on October 31st, 2019, after arriving back at Lanseria Airport (FALA) near Johannesburg. SELF-FLY OPTION* Total flying distance: 2075 NM | Approximate total flying time: 18:30 hours (C172), 17:30 hours (C182/C206) | Flying time check ride with South African instructor including overland: approx. 2:00 – 2:30 hrs. All aircraft owners charge block times from off-blocks to on-blocks. PASSENGER OPTION* Total flying distance: 2075 NM | Approximate total flying time: 17:30 hours. There is room for a minimum of 3 up to a max of 5 passengers that together share the flying costs while flying with a professional pilot and commercial operator in a 6-seater aircraft. The operator is based in Stellenbosch and charges a one-time transfer fee for getting the aircraft to/from the starting point of the Tour, which starting point is Lanseria Airport: €2550,00 | Flying costs including the professional pilot, all landing fees, fuel and accommodation/food for the pilot: €395,00 per flying hour. Based on 17:30 hours of flight during the trip, the cost with 3 passengers sharing will be €180,00 p.p. per flying hour and with 5 passengers sharing €108,00 p.p. per flying hour. An arrangement can be made directly with the aircraft operator. The above-mentioned charges include VAT. GROUP SIZE This tour is limited to a maximum of 4 participating aircraft or 8 participants, excluding the support aircraft with the guides coming along on the tour. WEAR Comfortable clothing suitable for safari and travel. Informal dinner attire for first few dinner nights in Pretoria. Good walking shoes if you want to participate in guided bush walks. Bring a hat or cap to protect against the sun. Take also with you some warm clothing for in the early mornings and evenings. ACCOMMODATION We will be staying in safari lodges, safari tents in tented camps as well as in a classic boat cabin on Lake Kariba. Some of the lodges, such as in Limpopo-Lipadi Private Game Reserve, Botswana are top-rated lodges. 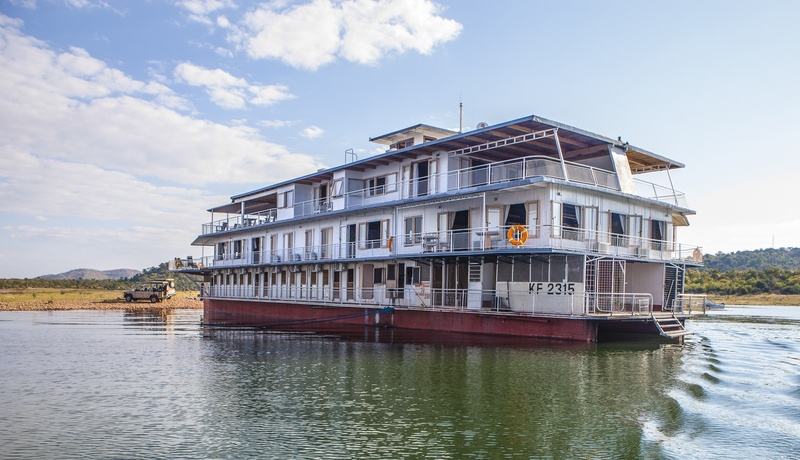 In Kariba, we will be boarding an old cruise boat from the old Rhodesian Times, which will instantly give you the idea that you are in a movie like “Out of Afrika”. The captain will dock the boat for the nights at one of the uninhabited islands of Lake Kariba or along its shoreline. Tamboti Tented Camp is our residence during our Kruger safari, which is considered one of the most beautiful places to stay in Kruger Park. During the 4x4Drive you will be sleeping in roof tents right on top of your 4x4Drive vehicle in designated camping areas in the bush in Botswana. At times, you will also be sleeping in tented camps on high-quality stretcher beds with proper linen and blankets, which allows you to experience the real African bush experience. GUIDES At least 2 guides will be embedded and coming along on this tour with their own support aircraft. 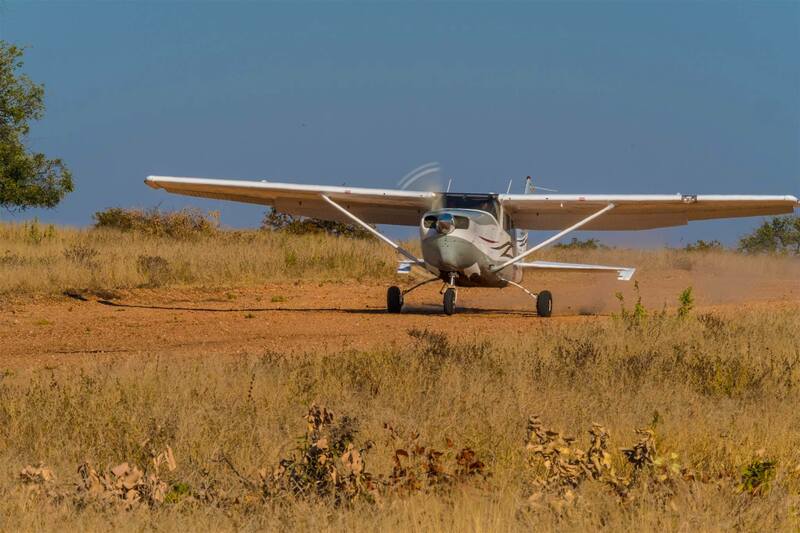 The guides have extensive knowledge and experience of the African bush and are both pilots with experience of flying in Africa. 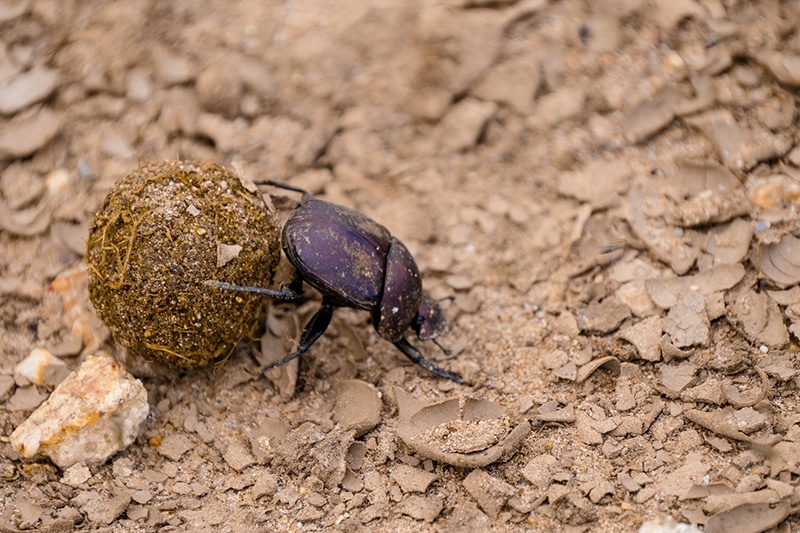 Some of the lodges have their own professional field guides with local knowledge, who will join us on the game drives, such as in Kruger National Park and at Limpopo-Lipadi. So you will have the best possible people around you to answer any questions that you may have. PACKAGE TRIP Yes, lodging and associated lodge safaris, the 4x4Drive safari in the Okavango Delta, the cruise on Lake Kariba and all the food and drinks are included and guaranteed by STO Garantiefonds (Dutch travel insurance). No flights, other transportation or optional activities you choose to take part in are a part of the offer. TERMS Our Terms & Conditions as found here and are applicable to this Tour offer. Airport pickup from O.R. Tambo on arrival Drop off at O.R. Tambo on the day of departure. €350 p.p. 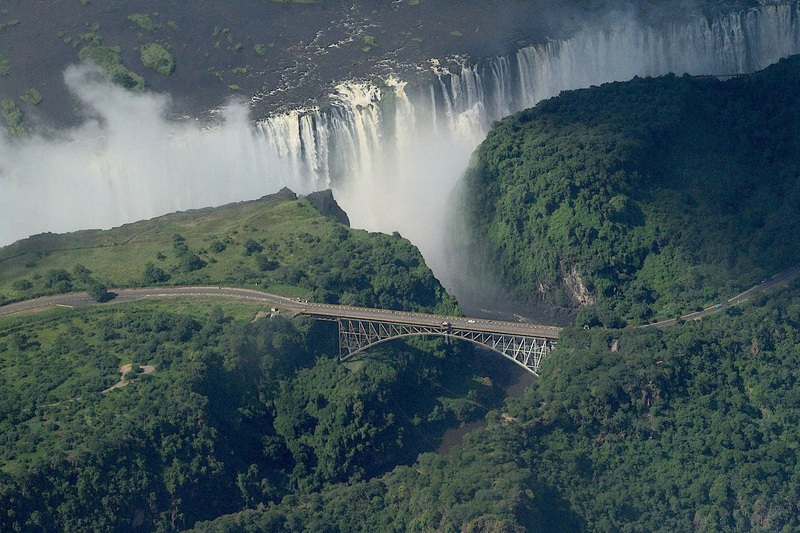 with a minimum of 4 signing up Bungee Jump over Zambezi River Bridge at Victoria Falls, €145,00 p.p. *Safaris, Game Drives and Guided Bush Walks are normally a part of the lodging arrangement in Africa and as such included in the price. 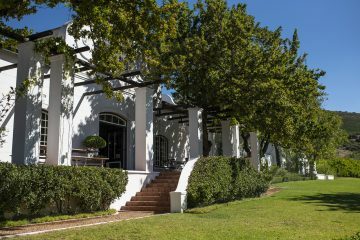 The accommodation is offered full-board including all the drinks, which include standard wines and beers but excludes exclusive champagnes, wines and spirits. The options (optional activities offered) are not a part of our tour offer price, nor are they a mandatory element of our tour. The options are available but have to be paid to the local operator offering the specific activity by credit card or in cash in Rand or US$. As for aircraft rentals, we provide you with the needed information about the aircraft owners willing to rent out their South African registered aircraft to you, so that you can arrange a direct rental agreement with one of them. We will make the arrangement for the pilot license validation and provide you with the contact information of a local flight instructor that will assist you with the validation of your EASA or FAA pilot license into a South African validated license. Arrival at O.R. Tambo International Airport, Johannesburg, South Africa. Start of the self-fly safari trip with a welcome dinner and drink around the campfire at The Farm Inn Urban Safari Lodge in Pretoria. This lodge will be our home base for the first few days from which you can get used to the sights, scents and smells of Johannesburg. Arrival at The Farm Inn Urban SafariLodge, Pretoria. Welcome dinner and campfire get-together. Reception The Farm Inn Urban Safari Lodge, Pretoria. Those that will pilot their own/rented aircraft on this tour will spend time together in the morning in a workshop on South African air law, followed by the Air Law theory exam just before lunch. In the afternoon, the pilot check rides with a South African flight instructor will take place at a nearby airport. After that, you will be handed out your South African pilot license and the aircraft will be handed over to you, so you will be fully ready for the next day departure without any worries. Non-pilots can relax at the lodge or join for an early morning game drive right at the Farm Inn Lodge. For those interested, there will be an option to join a guided walking tour through Alexandra Township in the afternoon or to visit a nearby crafts centre, visit the Apartheid Museum, Soweto or the Voortrekker Monument, this is completely up to you. Pilots: check ride in the afternoon with a South African flight instructor. Aircraft pickup and inspection and a flight to Lanseria Airport (FALA), from where we will depart on our 3-week tour. 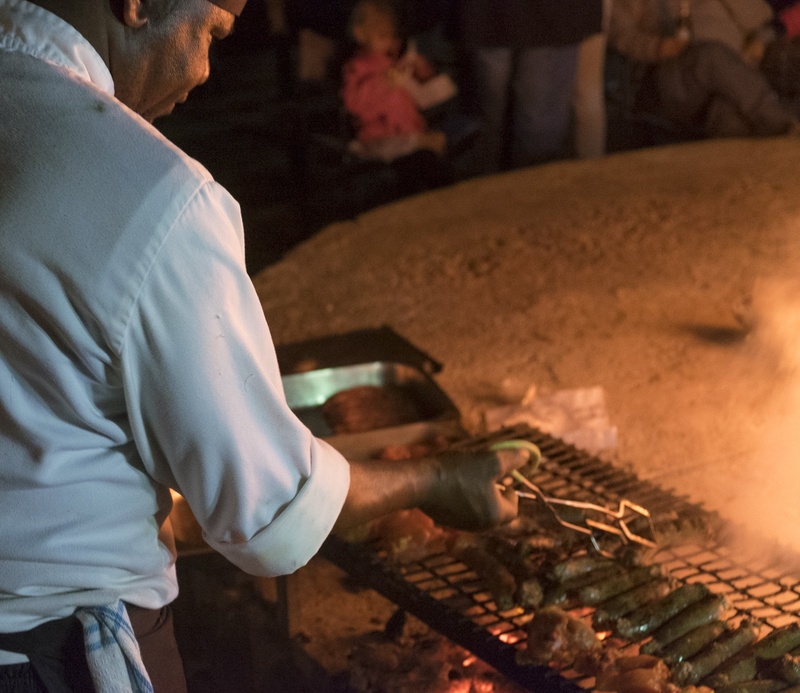 The day is concluded with a South African Braai in the boma with African music and dance. Here you will get to experience the real sounds of South Africa. Flight from Lanseria to Nsoko in Swaziland. We will clear customs/immigration out of South Africa at Lanseria (FALA) to fly to Swaziland and on arrival in Swaziland at Manzini Airport (FDMS), Swaziland before continuing our flight to our destination: Nsoko (FDNS). Flight from Lanseria Airport (FALA) to Manzini Airport (FDMS) in Swaziland. Flight from Manzini to Nsoko Airfield ((FDNS). Welcome by Swaziland locals at the airfield. Stay in a quality tented camp that we have built up for you on the grounds of a mission post near Nsoko. Visit of the local African community in Nsoko. Flight from Nsoko via Manzini to Kruger Int’l Airport. Flight from Nsoko back to Manzini Airport to clear customs/immigration. Flight from Manzini to Kruger Int’l Airport in South Africa (customs/immigration). Flight to Skukuza Airport near Kruger National Park (KNP). 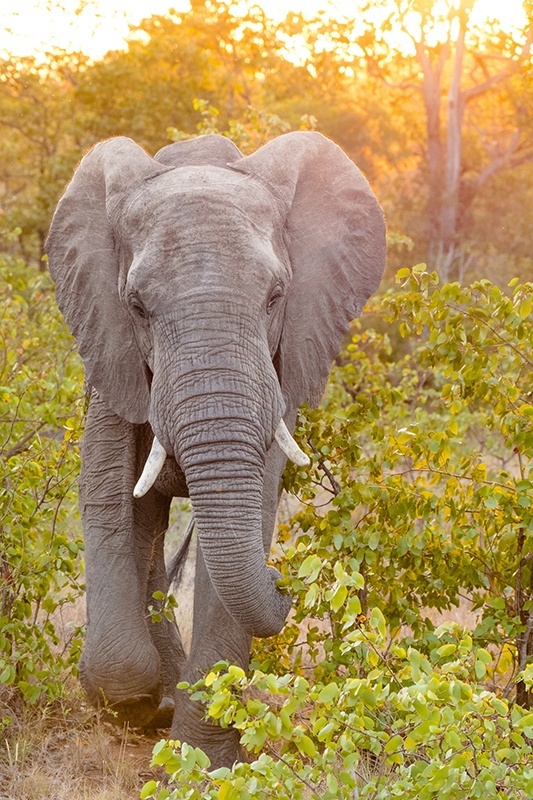 Drive into Kruger Park in open game safari vehicles in search of the Big Cats and to see the flora and fauna of South Africa, and take some beautiful pictures. Braai and sleep-over in Tamboti Tented Camp (KNP). The first of two full days of safaris in Kruger with our field guides in open safari vehicles in search of the Big Five. Professional guides will come along to guide your experience in the bush and to help you spot the animals, as well as answering any questions you may have about the nature around you and the animals that you see. Full day game-drive in open safari vehicles. Overnight stay in Tamboti Tented Camp inside Kruger National Park. 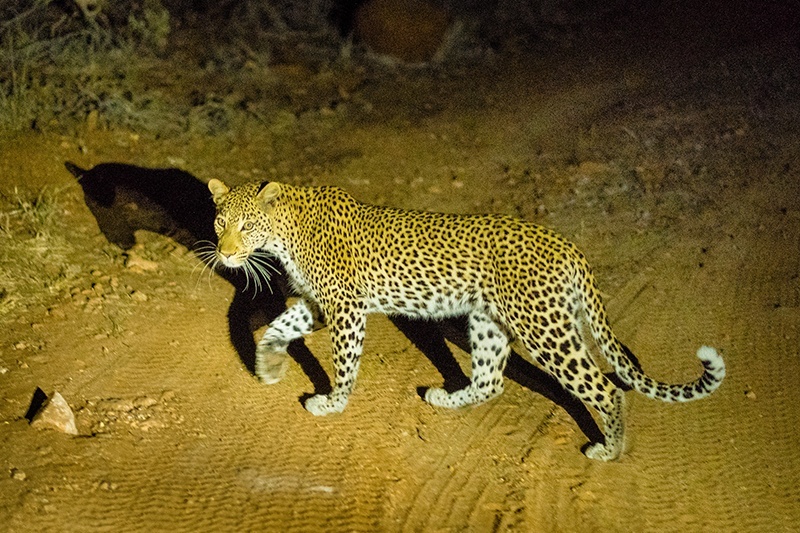 Continuation of our 2-day Kruger safari, giving you the opportunity to maybe spot some of the animals you missed the day before. Full day game-drive in open safari vehicles with our field guides. Overnight stay in Tamboti Tented Camp. Flight to Kwena Airfield near Lydenburg. 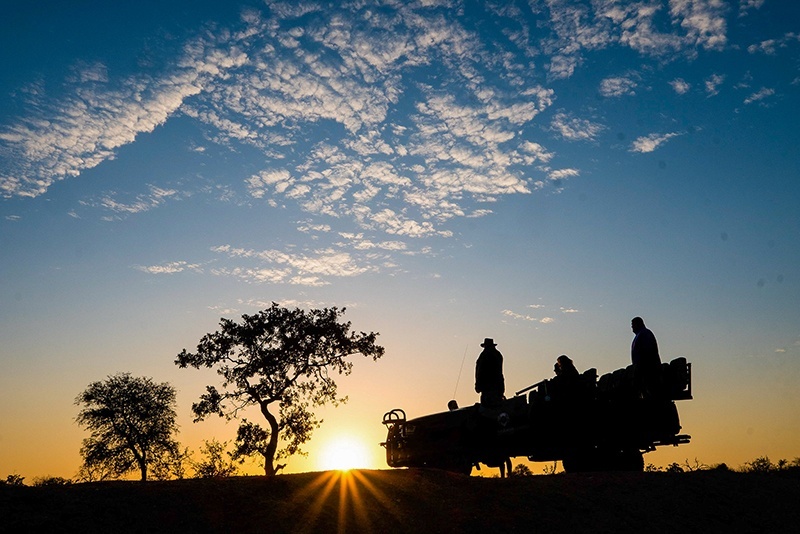 Early morning game-drive in open safari vehicles with our experienced field guides in Kruger National Park. Flight from Skukuza Airfield to a private airstrip called Kwena Airfield near Kwena Dam not that far from the town of Lydenburg. Braai on the airstrip with an overnight stay in our tented camp at the airfield. 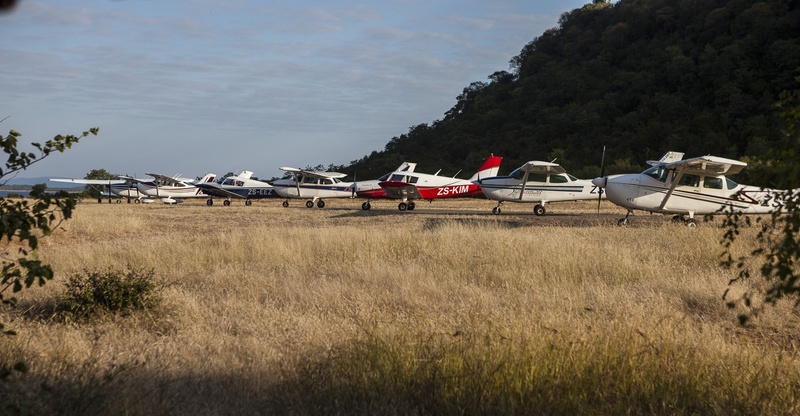 Opportunity to fly to several bush airstrips in the area. Our lunch will be at a trout farm after first flying through the third largest canyon in the world, the Blyde River Canyon and over a waterfall right next to the Trout Farm. This flight will provide some truly exceptional views, after which we will spend the night again at the tented camp at our private safari camp at the airfield in the Lydenburg area spending time around the fireplace that evening. Flight via Polokwane and Chiredzy to Masvingo, Zimbabwe. Flight via Polokwane, South Africa (FAPP) and via Chiredzi, Zimbabwe (FVCZ) to clear customs/immigration out of South Africa and into Zimbabwe. Flight from Chiredzi to Masvingo Airfield (FVMV). Visit of Great Zimbabwe, a medieval historical city, which was Zimbabwe’s capital in the country’s late iron age. Flight from Masvingo Airfield to Kariba Airfield, situated near Lake Kariba. Here we will board fast speed boats for a boat trip on Lake Kariba to the other side to Musango Safari Lodge. Flight Masvingo to Kariba airstrip. Boarding speed boats at Lake Kariba harbour. Overnight stay at Musango Safari Lodge. Game drive, Lake Kariba shore. 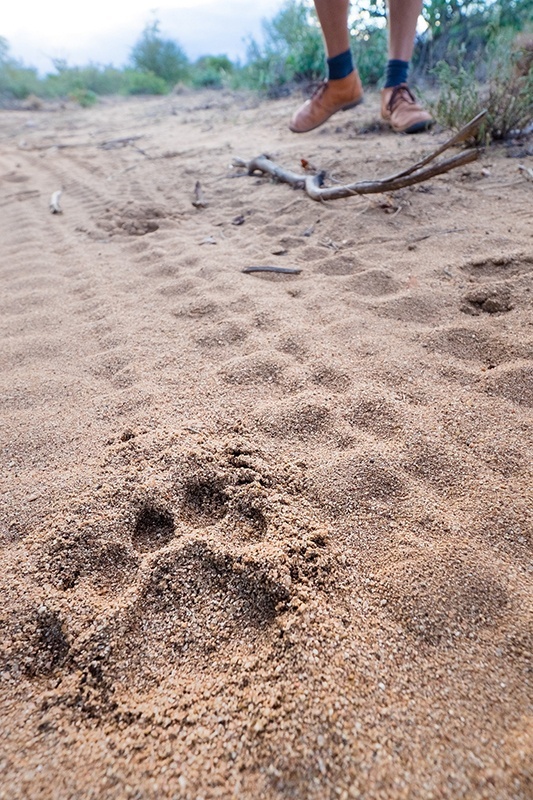 Walking safari, Lake Kariba shore. First full day on Lake Kariba. Big crocodile at Lake Kariba. Continuation of our safari on Lake Kariba. Flight from the Kariba airstrip to Victoria Falls Airport. Flight from Kariba Airfield to Victoria Falls Airport. An overflight of the Victoria Falls before arrival at Victoria Falls Airport. Overnight in Victoria Falls at our tented lodge. Visit Livingstone Island and the waterfalls early in the morning and, for the daredevils perhaps, take a plunge into the deep with a swim in the Devil’s Pool or stay at the hotel to quite simply enjoy and relax a bit. Visit Victoria Falls from the Zimbabwe side across the Victoria Falls bridge in order to view the waterfalls from their most impressive side, over 1700 m of thundering whitewater cascades. Optional: Early morning swim in the Devil’s Pool. Optional: Bungee jump overhead the Zambezi River from Victoria Falls bridge which marks the border between Zimbabwe and Zambia. 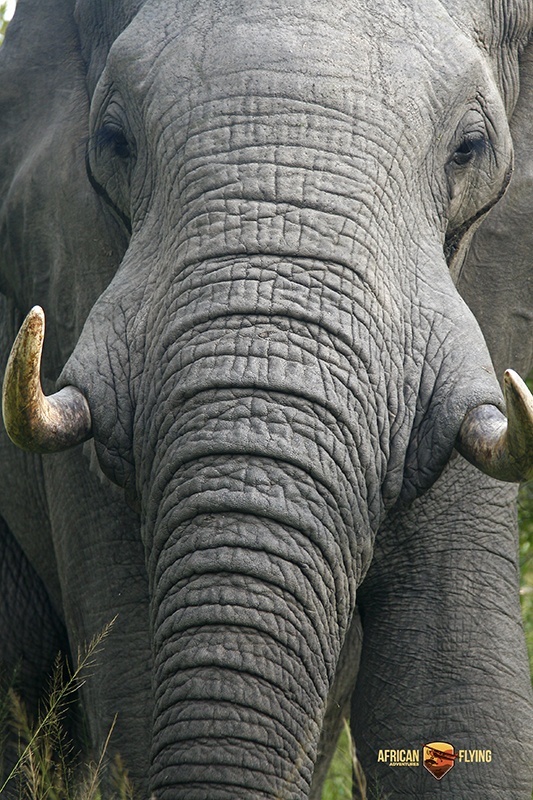 Optional: Elephant or Lion encounter event. Dinner at the tented lodge. Flight from Victoria Falls to Maun in Botswana. 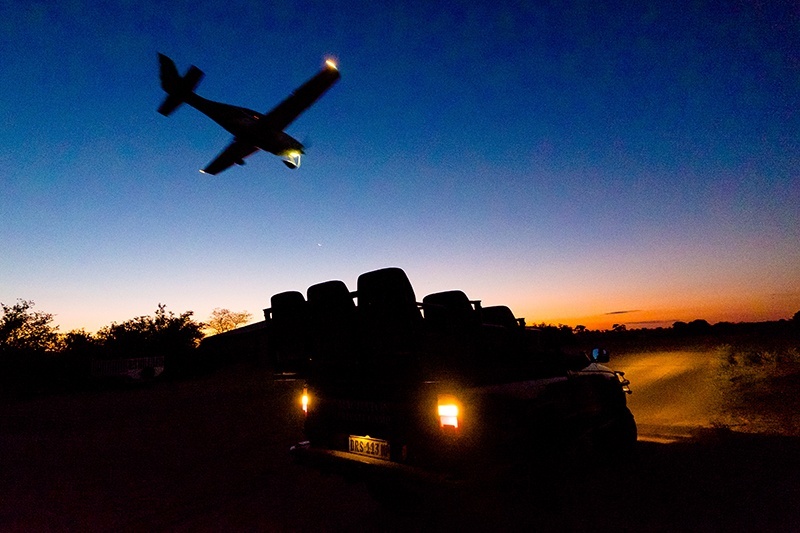 In Maun, we will park our aircraft for a few days and exchange the aircraft for either 4×4 vehicles for another kind of adventure where we will drive through the Moremi Nature Reserve in the Okavango Delta with 4×4 jeeps for a few days. Alternatively, you can opt for a stay in Oddballs Camp in the delta instead of participating in the 4x4Drive adventure, in which case Delta Air will fly you from Maun Aiport to the safari camps and back a few days later. The 4×4 vehicles are shared and those that join the 4×4 safari will sleep the coming days in roof tents on top of the vehicles or alternatively if they prefer in a safari tent. Dinner at Marc’s Eatery, Maun. Overnight stay the South Gate to Moremi National Park. If you prefer to go to a safari lodge in the Okavango Delta instead of doing the 4×4 Drive tour, you will be staying in Oddballs or Delta Camp where their safari guides will take you in Mokoro wooden open boats or on guided walking safaris twice daily. Explore the bush while driving a 4×4 vehicle. 4x4Drive safari through the bush in the Okavango Delta. Overnight stay in rooftop-tents on top of our 4x4Drive vehicles in small bush camps. Second full day of adventures and explorations driving through the Okavango Delta and Moremi Nature Reserve in 4×4 vehicles. Last full day of adventures and explorations driving through the Okavango Delta and Moremi Nature Reserve in 4×4 vehicles. Afternoon game-drive through the game reserve. Overnight stay in one of the private lodges inside Limpopo-Lipadi Private Game Reserve. 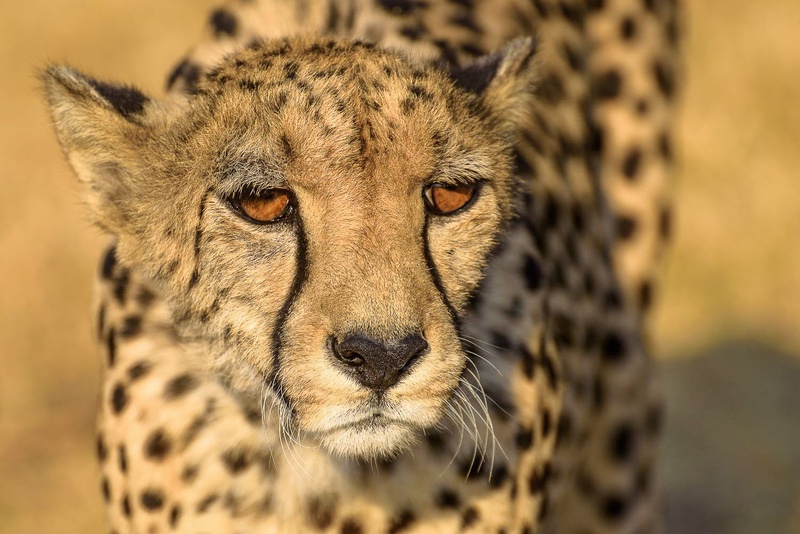 Full day stay with early morning and late afternoon classical game drives with a local professional safari field guide. Sundowner at the Limpopo River. 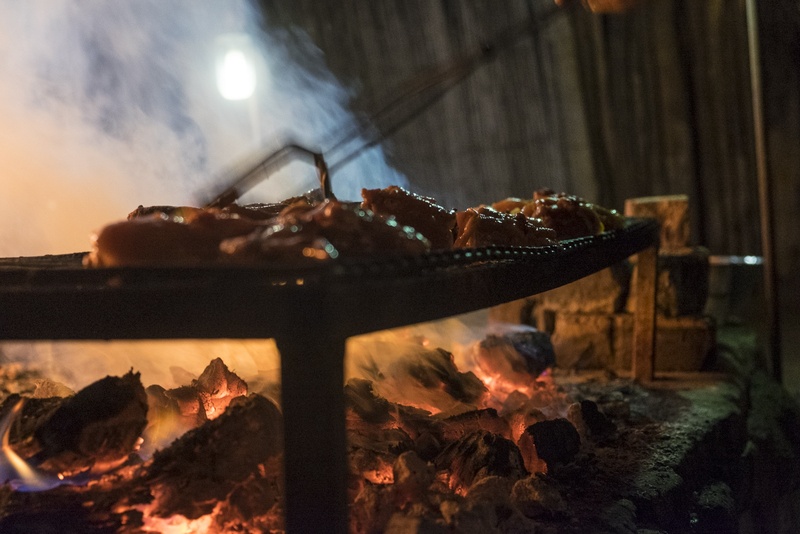 Evening Braai – our last meal before departure the next morning! The trip ends after flying from Limpopo airfield to Lanseria Airport near Johannesburg to clear customs/immigration. Early morning game drive on the last day of the trip. Flight back from Limpopo Lipadi Airfield to Lanseria near Johannesburg to clear customs/immigration. Delivery of aircraft to respective owners at Lanseria Airport (FALA). End of the 3-week self-fly safari trip. Optional: an additional overnight-stay at Cradle Boutique Hotel next to Lanseria Airport if your departure back home is the next morning. This 3-week Air Safari Tour will be guided and supported all along.